A fun little quirk of the first few days of a new baseball season is the wild swings of relievers’ statistics. A seventh inning guy who gets roughed up in the wrong spot can spend a week with gruesome numbers; a specialist who serves up a dinger to his lone assignment can spend a night or two with an infinite earned run average. It’s all just a product of small sample sizes, and for most pitchers things will regress back to the normal range soon enough. And then there’s Nationals reliever Trevor Rosenthal. Rosenthal made his first appearance for the Nationals in the eighth inning of their Saturday loss to the Mets. He allowed consecutive singles to Wilson Ramos and Jeff McNeil, loaded the bases by walking Amed Rosario, and was yanked after J.D. Davis hit a two-run go-ahead single. Rosenthal did not record an out. He appeared again on Sunday, again in the eighth inning, this time with runners on the corners and one out. 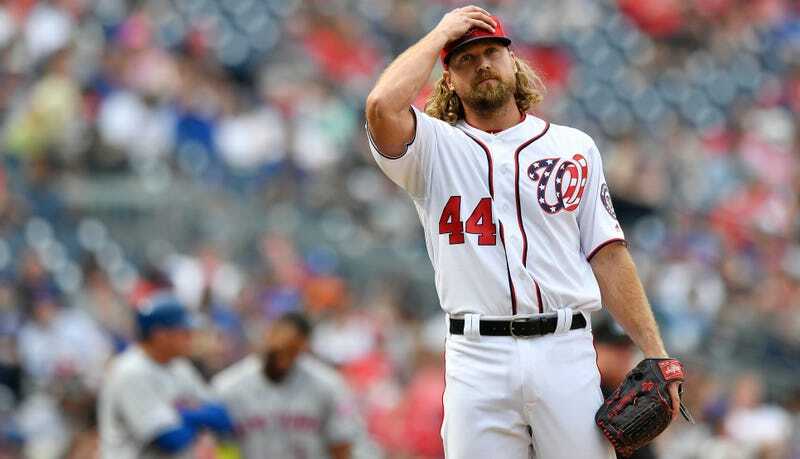 Rosario smacked his very first pitch into centerfield for an RBI single, and Nationals manager Davey Martinez yanked Rosenthal in favor of closer Sean Doolittle. Again, Rosenthal exited without recording an out. After not taking the mound during Tuesday’s ugly home loss to the Phillies, Rosenthal appeared again Wednesday afternoon, in the second game of the series, again in the eighth inning, again with one down and an inherited runner. He promptly walked Maikel Franco on seven pitches, and then walked Scott Kingery on five pitches, to load the bases. Martinez once again chose to yank him before he’d recorded an out. After three appearances, Rosenthal is still stuck on an infinite earned run average, because he has not yet been credited for pitching even a portion of an inning. This streak won’t last forever, as evidenced by the fact that it is a first in baseball’s long, long history. 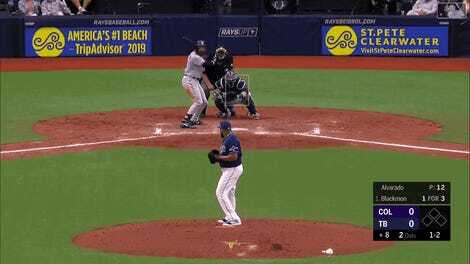 Rosenthal throws a blazing fastball, and very soon, whether he improves anything on his end or not, someone is going to pound one into the turf for a ground-ball out. In the meantime, Rosenthal chalked up his struggles to trying to be “too perfect.” To which I say, buddy, perfection can take many forms, and is truly in the eye of the beholder.